^ Guardians of the Galaxy Vol. 2 (2017). British Board of Film Classification. [2017-04-18]. （原始内容存档于2017-04-19）. ^ 2.0 2.1 Chandra, Jessica. 8 Weird And Wonderful Things That Happened At The 'Guardians of the Galaxy Vol. 2' Tokyo Premiere. Cosmopolitan. 2017-04-10 [2017-04-14]. （原始内容存档于2017-04-14）. ^ 'Guardians of the Galaxy Vol. 2' set to explode at the box office. LA Times. [2017-05-21]. ^ 4.0 4.1 Guardians of the Galaxy Vol. 2. Box Office Mojo. [2017-06-09]. ^ The Hollywood Reporter. Guardians of the Galaxy's Chris Pratt & James Gunn's Risky Film: Rule Breakers. YouTube. 事件发生在 2:30. 2014-12-17 [2014-12-22]. ^ 6.0 6.1 6.2 6.3 6.4 Keyes, Rob. 存档副本 ‘Guardians of the Galaxy 2′ Has Fewer Characters, One New. Screen Rant. 2015-06-03 [2015-06-04]. （原始内容存档于2015-06-04）. ^ Marvel Entertainment. Part 1- Marvel Studios' Guardians of the Galaxy Vol. 2 Red Carpet Premiere. 2017-04-19 [2017-04-20]. ^ Zalben, Alex. Vin Diesel Tells Us About His Marvel Movie Future. MTV. 2015-03-23 [2015-03-24]. （原始内容存档于2015-03-24）. ^ Jayson, Jay. New Guardians Of The Galaxy Vol. 2 Concept Art Released! First Look At Mantis!. Comicbook.com. 2016-07-15 [2016-07-15]. （原始内容存档于2016-07-16）. ^ 10.0 10.1 Evry, Mark. James Gunn Says Marvel Will be Absent from Comic-Con. Superhero Hype!（英语：Superhero Hype!）. 2015-03-09 [2015-03-09]. （原始内容存档于2015-03-09）. ^ Vejvoda, Jim. Guardians of the Galaxy Vol. 2: Zoe Saldana On Gamora, Nebula And Thanos. IGN. 2016-07-15 [2016-07-16]. （原始内容存档于2016-07-16）. ^ Peters, Megan. Sylvester Stallone's Mystery Role In Guardians Of The Galaxy Vol. 2 Revealed. Comicbook.com. 2017-04-17 [2017-04-18]. （原始内容存档于2017-04-18）. ^ 13.0 13.1 GALLAGHER, BRIAN. Adam Warlock & Original Guardians Join Marvel Cinematic Universe. Movieweb.com. 2017-04-21. ^ Cassidy, Mark. Miley Cyrus Will Provide The Voice Of In GUARDIANS OF THE GALAXY VOL. 2. Comicbook.com. 2017-04-21. ^ Damore, Meagan. Stan Lee's "Guardians of the Galaxy Vol. 2" Cameo Confirmed By Director James Gunn. Comic Book Resources（英语：Comic Book Resources）. 2016-08-04 [2016-08-09]. （原始内容存档于2016-08-09）. ^ Gunn, James. 存档副本 Today was our first day of the ‘pre-shoot.’ Next week is official 1st day of photography. Look for something then!. Twitter. 2016-02-11 [2016-02-18]. （原始内容存档于2016-02-17）. ^ Perry, Spencer. James Gunn Offers Update on Guradians of the Galaxy 2. Superhero Hype!（英语：Superhero Hype!）. 2015-04-03 [2015-04-04]. （原始内容存档于2015-04-04）. ^ First Film to Shoot on RED's 8K Vista Vision Camera is 'Guardians of the Galaxy 2'. No Film School. 2016-01-06 [2016-01-06]. （原始内容存档于2016-01-06）. ^ 19.0 19.1 Marvel Studios Begins Production on Marvel's 'Guardians of the Galaxy Vol. 2'. Marvel.com. 2016-02-17 [2016-02-17]. （原始内容存档于2016-02-17）. ^ Gunn, James. And that's a wrap on #GoTGVol2. WHEW. So much gratitude to my wonderful cast and crew. Thank you all.. Twitter. 2016-06-16 [2016-06-16]. （原始内容存档于2016-06-17）. ^ Damore, Meagan. James Gunn Pushes For More Gamora Merchandise, Talks "Guardians Vol 2". Comic Book Resources（英语：Comic Book Resources）. 2015-12-04 [2015-12-04]. （原始内容存档于2015-12-05）. ^ Cabin, Chris. 存档副本 ‘Guardians of the Galaxy 2′: Tyler Bates Will Return to Score Sequel. Collider. 2015-08-20 [2015-08-20]. （原始内容存档于2015-08-20）. ^ Dolloff, Matt. James Gunn to Live Stream Guardians of the Galaxy 2 Scoring Session. Screen Rant. 2017-01-24 [2017-01-24]. （原始内容存档于2017-01-25）. ^ Hiatt, Brian. Inside the 'Guardians of the Galaxy Vol. 2' Soundtrack. Rolling Stone. 2017-04-19 [2017-04-19]. （原始内容存档于2017-04-19）. ^ 'Guardians of the Galaxy Vol. 2' Score Album Details. Film Music Reporter. 2017-04-20 [2017-04-20]. （原始内容存档于2017-04-21）. ^ Kaye, Ben. Guardians of the Galaxy Vol. 2 soundtrack coming to vinyl and cassette. Consequence of Sound. 2017-06-06 [2017-06-08]. （原始内容存档于2017-06-08）. ^ Ganz, Jami. Watch the Guardians of the Galaxy Vol. 2 world premiere live. Entertainment Weekly. 2017-04-19 [2017-04-20]. （原始内容存档于2017-04-21）. ^ Siegel, Lucas. Marvel Announces Black Panther, Captain Marvel, Inhumans, Avengers: Infinity War Films, Cap & Thor 3 Subtitles. Newsarama（英语：Newsarama）. 2014-10-28 [2014-10-28]. （原始内容存档于2014-10-28）. ^ Keyes, Rob. 存档副本 ‘Guardians of the Galaxy 2′ Story Treatment Is Complete. Screen Rant. 2015-04-01 [2015-04-01]. （原始内容存档于2015-04-01）. ^ Han, Angie. 存档副本 ‘Star Wars: Rogue One’, ‘Captain America: Civil War’, and More Get IMAX Releases. /Film（英语：/Film）. 2015-04-08 [2015-04-08]. （原始内容存档于2015-04-08）. ^ Siegel, Lucas. SDCC 2014: Marvel Studios Panel Ant-Man Villain Revealed, Thanos Appears, GotG 2 Release Date. 2014-07-26 [2014-07-26]. （原始内容存档于2014-07-27）. ^ Guardians of the Galaxy Vol. 2 (2017). 爛番茄. [2017-06-09]. ^ Guardians of the Galaxy Vol. 2. Metacritic. [2017-04-26]. ^ Robbins, Shawn. Long Range Forecast: 'Guardians of the Galaxy Vol. 2' Prepping for $150M+ Summer Launch. BoxOffice（英语：BoxOffice (magazine)）. 2017-03-10 [2017-03-10]. （原始内容存档于2017-03-11）. ^ D'Alessandro, Anthony. ‘Guardians Of The Galaxy Vol. 2’ Hits Tracking: $150M Opening Within Reach. Deadline.com. 2017-04-13 [2017-04-13]. （原始内容存档于2017-04-13）. ^ Nancy Tartaglione. ‘Guardians Of The Galaxy Vol 2’: $100M Offshore Bow In The Mix? – International Box Office Preview. Deadline Hollywood. 2017-04-25 [2017-04-25]. ^ 許世穎. 《星際異攻隊2》稱霸全台 吸金狂勝首集1.6倍. 自由時報. 2017-05-02. ^ 許世穎. 《星際異攻隊2》全台二連霸！吸金超越首集總票房. 自由時報. 2017-05-08. ^ 全國電影票房截至2017年九月前資訊 (PDF). 國家電影中心. 2017-10-05. ^ Couch, Aaron. 'Guardians of the Galaxy 3': James Gunn Returning to Write and Direct. The Hollywood Reporter. 2017-04-17 [2017-04-20]. （原始内容存档于2017-04-17）. ^ James Gunn Fired as Director of 'Guardians of the Galaxy Vol. 3'.Hollywoodreporter.2018-07-20.[2018-07-21]. ^ Jr, Mike Fleming. 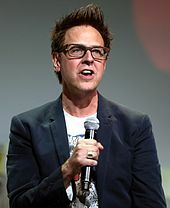 Disney Reinstates Director James Gunn For ‘Guardians Of The Galaxy 3’. Deadline. 2019-03-15 [2019-03-17] （英语）.